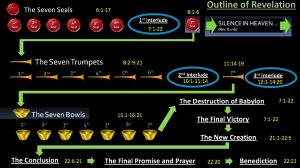 As was the case before the opening of the 7th seal judgment where we had an interlude that featured two visions: the 144,000 in 7:1-8 and the great multitude, we yet again have an interlude before the 7th trumpet is to be blown. In each of these interludes, attention is being drawn to happenings within the church, around whose life all events in history orbit, at least as far as heaven is concerned. While the world of unbelievers is being dealt with punitively (Afrikaans: “hulle word gestraf”) by God, the church is singled out for peculiar protection and commissioning. She (the church) is God’s special agent in drawing to Himself His elect children, by the power of the Gospel. In chapter 10 we have a picture of a mighty angel that came down from heaven. There are two camps in the world of theology about who or what this angel might be. Some say that this was an angel who has all the marks resembling Christ Jesus (1:7; 4:3), but who is not Christ, because Christ is never called an angel in the book of Revelation. Another reason that is given as motivation that this angel is not Christ, is because John is not worshipping this angel as was the case in Rev.1:17 ~ “When I saw him, I fell at his feet as though dead. But he laid his right hand on me, saying, “Fear not, I am the first and the last…” A further motivation for these proponents is the fact that John refers to this angel as “another mighty angel,” implying that he was no more than an angel than the others preceding him in chapter 9. This angel is therefore, according to this viewpoint, only one that represents Christ and carrying His message. There are however another group of theologians that say that this must be Christ Himself and they base their viewpoint on the fact that this picture is very similar to the one in Rev.1:12-16 ~ “Then I turned to see the voice that was speaking to me, and on turning I saw seven golden lamp stands, and in the midst of the lamp stands one like a son of man, clothed with a long robe and with a golden sash around his chest. The hairs of his head were white, like white wool, like snow. His eyes were like a flame of fire, his feet were like burnished bronze, refined in a furnace, and his voice was like the roar of many waters. In his right hand he held seven stars, from his mouth came a sharp two-edged sword, and his face was like the sun shining in full strength.” In Rev.1, Jesus is said to have “eyes as a flame of fire.” Here in Rev.10, the “mighty angel” is said to have a “face…as if it was the sun.” In Rev.4:3 “there was a rainbow around the throne” and in Rev.10 the “mighty angel” has a “rainbow…upon his head.” Rev.1:7 told its 1st century audience that Jesus “is coming with the clouds” and “the mighty angel” in Rev.10 is “clothed with a cloud.” In short, both Rev.1 and Rev.10 portray pictures of regal majesty. It is a picture of One Sovereign rather than an angel in submission to the Sovereign One. Although Jesus is never called an angel in the New Testament – apart from Rev.1:12-16, He is, however, referred to several times in the Old Testament as “the angel of the Lord” (e.g. Gen.16:7-13; 22:15-18; Ex.3:1-4; etc.). Although this angel has all the marks resembling Christ, we still cannot for certain say that this is a description of Christ or an angel, although I tend to agree with the those who say that this “angel” is an angelic being rather than Christ Himself, because three “strong angels” appear in Rev.5:2; 10:1 and 18:21, and the first two are both associated with the scroll of God’s redemptive plan. This angel had a little scroll in his hand. This reminds us of the scroll in Rev.5 and yet again there are different interpretations between commentators whether these two scrolls are the same or two different scrolls. While there are variations between these two scrolls (e.g. scroll vs. little scroll, sealed vs. open, heavenly scene vs. earthly scene), the similarities suggest that a single scroll is in view here, because both are held by a mighty angel, both draw on Ezekiel’s prophetic calling (Ezek.2:9-3:3), and both concern God’s redemptive plan. The expression of a “little scroll” here in 10:2 most probably wants to emphasise the size of the angel rather than the size of the scroll. It is also important to note that the scroll was still sealed with seven seals in chapter 5 and then it was opened by the Lamb in Rev.6, but now here in chapter 10, the scroll is open and lies in the angel’s hand. The angel is robed (clothed) in a cloud, which denotes majesty as we see in Ps.97:1-2 where Jesus’ majesty is described ~ “The Lord reigns, let the earth rejoice; let the many coastlands be glad! Clouds and thick darkness are all around him; righteousness and justice are the foundation of his throne.” Furthermore, this angel has a rainbow on his head, symbolising one who is faithful to a covenant over which he is given administration. He has a face like the sun because it is glorious to behold, and has feet like pillars of fire, denoting consuming might (Ps.97:3). Coming down from heaven, he must be on a special assignment on behalf of God Almighty. The angel stood with his right foot on the sea and his left foot on the land, demonstrating his unrestricted ministry and dominion – it is without frontiers. His power and authority is indicated in a loud voice like the roar of a lion. After this messenger from heaven – this mighty angel – placed himself on the sea and the land, he opened his mouth and he ~ “called out with a loud voice like a lion roaring” (10:3a). As we’ve noted earlier, the roaring of the lion is often used in prophetic literature to denote God’s judgment ~ “The lion has roared; who will not fear? The Lord God has spoken; who can but prophesy?” (Amos 3:8). We see in 10:3b-4 that when the mighty angel shouts, the seven thunders also speak. Thunder is often associated with judgment in Revelation, and here the “seven thunders” are likely yet another series of divine judgments. John hears and understands the message of the seven thunders, but a voice tells him to seal what they say (i.e. keep it secret) and not write it down. A similar command was given to Daniel in Dan.12:4a ~ “But you, Daniel, shut up the words and seal the book, until the time of the end.” We can only speculate about why John was told to seal up the thunderous message. In addition, the thunders are sealed but the scroll lies open, indicating that there will be no further intervention. The fulfilment of God’s purposes is at hand. It is also very interesting to note that this angel in vs.5… ~ “…rose his right hand to heaven and swore by Him who lives forever and ever” (10:5-6). This is the only time in Revelation where anyone swears an oath, and the background is Dan.12:6, where the prophet asks a question about the end of time ~ “How long shall it be till the end of these wonders?” It is important to note that the figure in Daniel also swears by Him who lives forever ~ “And I heard the man clothed in linen, who was above the waters of the stream; he raised his right hand and his left hand toward heaven and swore by him who lives forever …” (Dan.12:7). So far John has received instructions not to write what he heard from the seven thunders, but in 10:8-9 he is instructed to take the little book from the hand of the mighty angel. Instructions are coming from an unidentified voice from heaven. Unlike before, this time John is required to proclaim the truths of this book with its bitter-sweet effects. Earlier I said that this book is described as a “little book” most probably because of the massive size of the mighty angel, but another reason can be, because it does not contain the entire purpose of God as does the scroll mentioned in Rev.5:1. This “little book” is open as compared to the sealed scroll in 5:1, or the message from the seven thunders (10:4) which are closed. Being open or revealed, this “little book” is ready for immediate use by man. John is now instructed to take this book that was lying open on the palm of the angel’s hand, and eat it. First, John went to the angel and asked him to give him the little scroll. The angel in turn said to John, now in the language of Ezekiel (Ez.2:8-3:14), to eat the book. Ezekiel was given the same instruction, namely to eat a book that was given to him and the taste was exactly the same. Both Ezekiel and John experienced a sweet taste in their mouths – sweet as honey ~ “Your words were found, and I ate them, and your words became to me a joy and the delight of my heart, for I am called by your name, O Lord, God of hosts” (Jer.15:16). In both Ezekiel and John’s case, the eating of the book was a symbol of ingesting God’s message – the Word of God and it is clear that the message of the Gospel brings exceeding sweetness to the heart of the believer, because God will conquer evil once and for all, vindicate His people, and bring forth a new heaven. However, when John swallowed the book it made his stomach bitter. This bitterness represents the suffering and persecution that God’s people will endure before Christ’s second advent. The bitterness also symbolises what awaits the unbelievers who rejected the Gospel message and God’s Word. John experienced sweet and bitter when eating the “little book,” likewise we as believers also experience sweet and bitter in our Christian walk. Much about God and His eternal plan is yet to be known. In fact, it is very improbable that everything will ever be known. As mortals we must learn to accept the fact that since God has not chosen to reveal everything, we will not understand everything. And we should not try to. Each truth God wants us to know He Will unfold at His own chosen time. 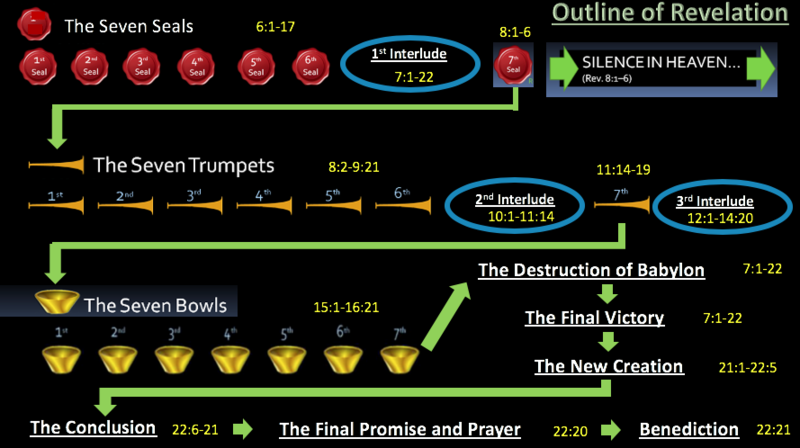 For each inscrutable situation or uncertainty, we must remember that there is a 7th trumpet yet to be blown. However, much else has been revealed about God and His plan for us to be guided by and to work on. All that we need for life and godliness God has disclosed. In His Word, God has given us life changing truths for our own transformation and the transformation of others as well. The privileges that believer’s not only understand as these revealed spiritual things (1 Cor.2:12), but also to be the divinely chosen instrument of their proclamation, whatever their negative effects. To discover God and to reveal Him to others is the greatest honour. As for the world of sinners, their only hope lies in their warm embrace of this very Gospel message, however humbling its truths. Without this, they are unquestionably consigned to the damnation sounded out of the six trumpets and laid bare in the seven seals.